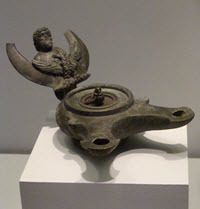 When Perseus cut off Medusa's head, the blood sinking into the earth produced the winged horse Pegasus. Minerva caught him and tamed him and presented him to the Muses. The fountain Hippocrene, on the Muses' mountain Helicon, was opened by a kick from his hoof. The Chimaera was a fearful monster, breathing fire. The fore part of its body was a compound of the lion and the goat, and the hind part a dragon's. It made great havoc in Lycia, so that the king, Iobates, sought for some hero to destroy it. At that time there arrived at his court a gallant young warrior, whose name was Bellerophon. He brought letters from Proetus, the son-in-law of Iobates, recommending Bellerophon in the warmest terms as an unconquerable hero, but added at the close a request to his father-in-law to put him to death. The reason was that Proetus was jealous of him, suspecting that his wife Antea looked with too much admiration on the young warrior. From this instance of Bellerophon being unconsciously the bearer of his own death warrant, the expression "Bellerophontic letters" arose, to describe any species of communication which a person is made the bearer of, containing matter prejudicial to himself. Iobates, on perusing the letters, was puzzled what to do, not willing to violate the claims of hospitality, yet wishing to oblige his son-in-law. A lucky thought occurred to him, to send Bellerophon to combat with the Chimaera. Bellerophon accepted the proposal, but before proceeding to the combat consulted the soothsayer Polyidus, who advised him to procure if possible the horse Pegasus for the conflict. For this purpose he directed him to pass the night in the temple of Minerva. He did so, and as he slept Minerva came to him and gave him a golden bridle. When he awoke the bridle remained in his hand. Minerva also showed him Pegasus drinking at the well of Pirene, and at sight of the bridle the winged steed came willingly and suffered himself to be taken. Bellerophon mounted him, rose with him into the air, soon found the Chimaera, and gained an easy victory over the monster. After the conquest of the Chimaera Bellerophon was exposed to further trials and labors by his unfriendly host, but by the aid of Pegasus he triumphed in them all, till at length Iobates, seeing that the hero was a special favorite of the gods, gave him his daughter in marriage and made him his successor on the throne. At last Bellerophon by his pride and presumption drew upon himself the anger of the gods; it is said he even attempted to fly up into heaven on his winged steed, but Jupiter sent a gadfly which stung Pegasus and made him throw his rider, who became lame and blind in consequence. After this Bellerophon wandered lonely through the Aleian field, avoiding the paths of men, and died miserably. Into the Heaven of Heavens I have presumed, An earthly guest, and drawn empyreal air (Thy tempering); with like safety guided down Return me to my native element; Lest from this flying steed unreined (as once Bellerophon, though from a lower sphere), Dismounted on the Aleian field I fall, Erroneous there to wander and forlorn." "He whose blind thought futurity denies, Unconscious bears, Bellerophon, like thee His own indictment, he condemns himself. Who reads his bosom reads immortal life, Or nature there, imposing on her sons, Has written fables; man was made a lie." Pegasus, being the horse of the Muses, has always been at the service of the poets. Schiller tells a pretty story of his having been sold by a needy poet and put to the cart and the plough. He was not fit for such service, and his clownish master could make nothing of him But a youth stepped forth and asked leave to try him As soon as he was seated on his back the horse, which had appeared at first vicious, and afterwards spirit-broken, rose kingly, a spirit, a god, unfolded the splendor of his wings, and soared towards heaven. Our own poet Longfellow also records an adventure of this famous steed in his "Pegasus in Pound." "I saw young Harry, with his beaver on, His cuishes on his thighs, gallantly armed, Rise from the ground like feathered Mercury, And vaulted with such ease into his seat, As if an angel dropped down from the clouds, To turn and wind a fiery Pegasus, And witch the world with noble horsemanship"